This 1982 Amel Mango 52 is powered by a Perkins 82CV diesel engine with a 3-blade bronze propeller. She is equipped with a bow thruster for additional manoeuvrability. She also benefits from a Webasto J5KW 12v diesel heater. Rigging on board this Amel Mango 52 Ketch includes a Francespar aluminium deck stepped mainmast; a Francespar aluminium deck stepped mizzen mast; mainsheet traveller; spinnaker pole; back stay adjuster; and roller furlers for main and genoa. Her sail wardrobe includes: main sail, 2x genoas, mizzen, asymmetric spinnaker and storm sail. 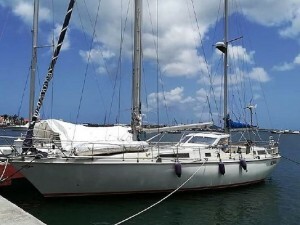 This Amel Mango 52 provides accommodation within 3 cabins. There is master cabin aft with a double berth and an ensuite bathroom. A further double cabin if located forward with an additional single berth. There is a bunk cabin on the starboard side and a guest bathroom to port. The saloon of this Amel Mango 52 features a U-shaped sofa with a dining table, and a further bench sofa to starboard with can also be used as a single berth. The galley is well equipped with a double stainless steel sink; Coolmatic 12V refrigerator, Coolmatic 12V freezer; Eno 2 burner stove with oven and grill (2017); 220V water heater; and pressurized water.